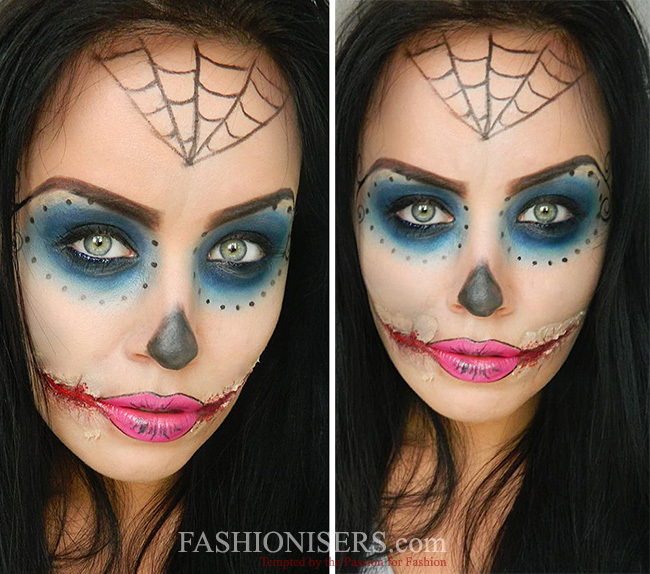 Halloween can be rightly considered the spookiest holiday of the year and this is not because it’s terrible and boring, but because your Halloween makeup and costume should scare everyone around! Whoever you choose to be ” a seductive vampire or a witch from the famous cartoons, a creepy doll from horror movies or a glamorous zombie girl, your main task is to create a unique, memorable look that will both surprise and frighten your friends. 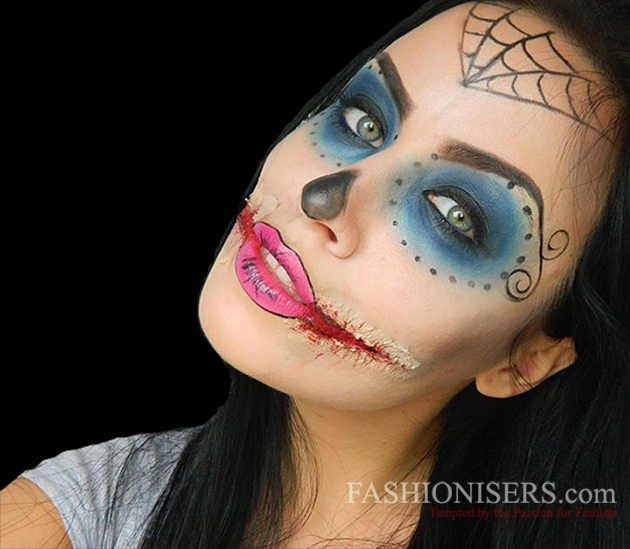 In case you can’t find your inspiration in the parade of Halloween makeup ideas, we come up with the Monster High makeup tutorial for Halloween that is sure to take your breath away! Step 1: Apply a high coverage pale foundation all over your face, after you have used some base first. Contour your face with a matte taupe eyeshadow. Step 2: If you don’t have extra-long eyebrows, cover the ends of your brows with a glue stick. Then, apply concealer over it. Using a brow wax, draw the new, longer brows lifting the ends of your natural eyebrows slightly. Over the brow wax, apply a dark eyeshadow to make the final look more natural. 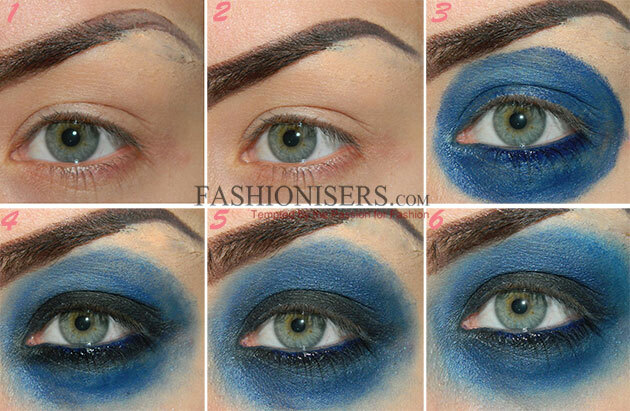 Step 3: Apply a navy blue base all over your eyelid and under your eyes, creating a circular shape (E.L.F. Jumbo Pencil in Like a Boss). Blend the edges well. Next, apply a black eyeshadow all around your eyes. Blend the black color with a navy blue eyeshadow. Next, blend the navy blue color with a matte blue eyeshadow, which already needs to be blended with a light blue one to the edges of the circle you have created. All the eyeshadows used are from the Coastal Scents Smokey palette. Step 4: At the end of your eyebrows draw some pattern lines, like the ones in the images. With a black pencil draw dots around the blue circle you have created. Step 5: Paint the tip of your nose with a black pencil or a black eyeshadow. Step 6: Apply a magenta lipstick (Flormar Longwearing Lipstick L 34). Contour your lips with black eyeliner. Draw fake strokes at the corner of your lips with the same black liner. Step 7: Rip thin strips from a paper napkin. Then, apply some lash glue on your skin, on the edges of the black lines that you have drawn around your lips. Glue the paper strips to your skin. Wet them with water using your fingers. Repeat this process a few times. You have to do the same process both on the upper and lower parts of the black contours. Now, take the tweezers and pull up the inner edges of the fake wound for a more authentic look. Cover the entire area with a concealer and apply brown, purple and taupe eyeshadows with a blending brush. This will create a bruise effect. Step 8: Next, inside the fake wound apply black eyeshadow to the edges and some red and wine lipstick colors. Step 9: With black eyeliner draw a spider web on your forehead and you are done! The best thing about this Monster High makeup is that it’s both edgy and sophisticated, ideal for a delicate feminine Halloween look! In case you want to try something other than this look, you can check out the Creepy Doll makeup tutorial or just go for the classic Candy Corn makeup look!